On May 19, 2010, the World Team Poker $50,000 Inaugural event took place at the Golden Nugget in Las Vegas. World Team Poker and Fox Sports Net will air the $50,000 Inaugural Event as a new television series. A teaser episode is scheduled to be broadcast on July 14, 2010. Then, viewers will see the drama unfold over one-hour episodes, broadcast nationally on Sunday nights, beginning September 2010. Regional and repeat airings will show on FSN throughout the week; check your local listings times and channels. Times and channels may vary per region. To find show times and channels in your area, check your local listings. 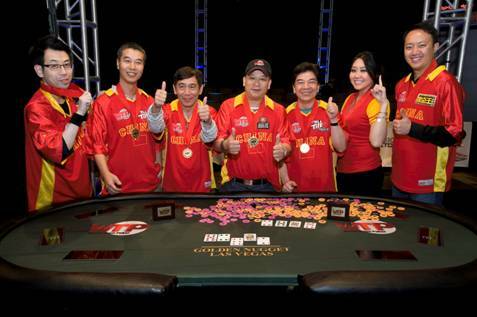 WORLD TEAM POKER 2010 - CHINA WINS AND BRAZIL IS SECOND. Chau Giang, Mario Ho, Winfred Yu, Rich Zhu, and Derek Cheung.